You only have to pick your phone and scroll through Facebook or Instagram to see that hitting the gym and pumping some iron has become incredibly popular. For many of the #fitfam brigade, working out is mainly for keeping in shape or as an enjoyable pastime which allows them to de-stress from a day at work. Yet for strength athletes who compete, lifting weight it is a way of life. One such athlete is Michelle Guthrie who was recently crowned the Republic of Ireland's Strongest Woman for the lightweight category in New Ross, Co Wexford on July 1. Having lived in Galway since 2005 after studying in NUI Galway, the Clare native says the discipline of strongwoman is the same as the strongman, which has produced notable athletes such Eddie Hall, Terry Hollands, and Hafþór Júlíus Björnsson, better known as 'The Mountain' from Game of Thrones. She says; "We do all the same events as the men and we are catergorised by three different weights; lightweight which under 64kgs; middleweight under 82kgs; and heavyweight which is open weight." Joining Michelle in the medals' haul in Wexford was Ayesha Ullah who won the heavyweight category. Michelle, who is also an all-Ireland power lifter champion for 2015, 2016, and 2017, said a chance meeting with Ayesha and her coach Matty Costello introduced her to strongwoman. "I took part in the all-Ireland power lifting competition in August 2015 and I won that tournament and progressed to the world championships in Sicilly where I placed third, and at that competition I met Ayesha for the first time. Even though Ayesha was based in Galway, we did not know each other. We were based in different gyms. "Our present coach was preparing a programme for her and I did not have a coach at the time and I wanted to get better so I got in touch with him. He was organising a strongwoman competition as a fundraiser for Cancer Care West in that December and because I was not power lifting at the time I decided to give it a try. I had a lot fun, very much enjoyed it and I wanted to see how far I could go so I spoke with Matty and here I am." Michelle's success over the past three years is all the more impressive when it is taken into consideration that she only started power lifting in 2015. "In 2014 I started doing circuit classes and after a year and a bit I was looking for the next challenge I came across a weightlifting workshop in Galway. It was the first time I picked up a bar bell and dead lifted 90kgs and I thought I really like this, so I switched then from circuit classes to the bar bell and I progressed quite fast. "There was a lot of weight based work in it, and from a leader board of lifts and I could see that my numbers were comparable to those who were competing. So I checked out the different power lifting federations in Ireland and decided then to give it a shot. I took the decision around May of that year to compete and took part in a tournament in August. I got the bug when I competed and I won, which was a surprise because it was my first tournament. So I decided to see where I could go with it." Michelle currently trains at Galway Strength and Performance gym which opened in April this year in Ballybrit by her coach Matty Costello. "The aim of the gym is to have a place where strength athletes can train. Power lifting and strongman and strongwoman cannot be down in a conventional gym because first of all, power lifters need a lot of weights because it is the main element of the game. Also when you are doing power lifting training sessions there are longer breaks between sets so if you are in a squat rack, you could be in it in an hour an half and you would not be able to do that in a normal gym. "We also have specialised equipment that is made specifically for strength athletes by Galway company Spartan Gym Equipment. In strongman or strongwoman you need specialised equipment such as dumb bells and atlas stones. It is hoped that the strength community in Galway will grow thanks to the gym and there will be two beginners' competitions in the next couple of weeks." Michelle says for anyone who considering to participate in strength lifting there is only one decision to take. "It has changed my life. I love it. I am very dedicated to it and I get a lot from it, so I do spend a lot of time training even though I work a full time job because the expense is all ours as we have no sponsorship. "But for somebody who just wants to get in shape or looking for a challenge it is definitely the way to go. It is a great way to meet new people and the community is growing very fast especially for women. A person who works nine to five day and is not the biggest, most muscular girl, can still do it and do very well in it." As part of a fundraiser for the Special Olympics Equestrian team, Galway Strength and Performance is running a beginners' competition in Oughterard on August 6. Michelle says; "The weights that are in this competition are something somebody who is training in the gym on weekly basis can attempt and do well, so anyone looking to try out is more than welcome. My coach Matty is organising it as he is the Republic of Ireland's representative of the federation, Renegade, which is sanctioning this competition. "This will be the first strongman competition Renegade has run in Galway. 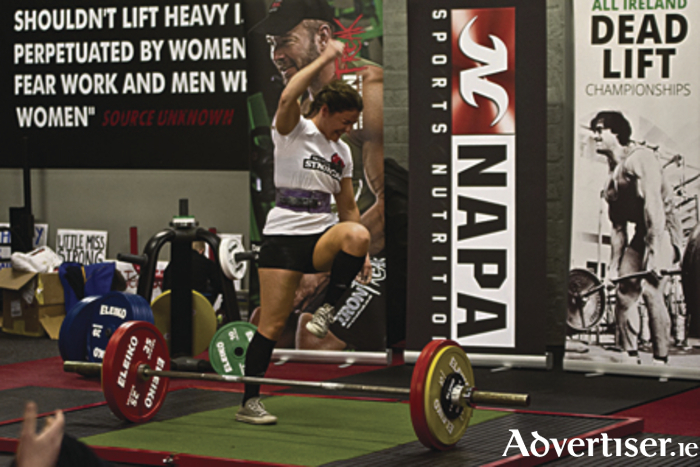 It will be a great day and great opportunity to start or see a strongman or a strongwoman competition." Looking ahead for Michelle, she could be forgiven for taking it easy for the next few weeks and enjoying her success. However, the all-Ireland competition is on the September 23. "I had a rest week after the Republic of Ireland championships which was two days at the gym. I have now started my training for the all-Ireland on last Monday. This is in the gym four days a week and a conditioning session to make sure my physical fitness is order. The training consists of four weight based sessions a week and they last between two or three hours in the evening. We know the events what will be in the competition in September so I will train for those events, and by 10 or 11 weeks' time, when I start to wind down for the competition, I will have a better idea of how I will perform." And Michelle and her teammates will be hellbent on success in Dublin as there is the huge carrot of competing at the world championships in North Carolina. "I got word two weeks ago that my weight category will be at the world championships in December 15 to 17. There is a qualifying process for that which has not been released but all going well, my teammates Ayesha, Matty and myself get our tickets to North Carolina." Page generated in 0.2430 seconds.